Rhaponticin (RHA) is a stilbene glucoside compound that can be found in medicinal plant of Rheum L. RHA has been reported to possess several biological effects including antitumor, antithrombotic, antioxidant, vasorelaxant, defense for gastritis activities. It also shows beneficial activities on diabetic mice. According to reported literatures, an overview of spectroscopy characteristics, pharmacological activity, content determination and pharmacokinetics, etc. for RHA has been presented. Moreover, this work provides a certain reference value for developing the therapeutic drug of RHA. Keywords: Rhaponticin, stilbene glucoside, anti-diabetic activity, structural characteristics of RHA, anti-oxidation activity, anti-allergic activity. 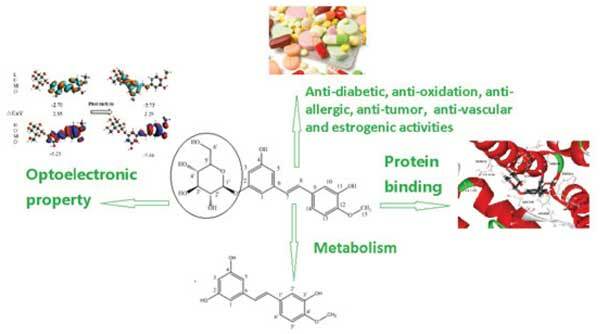 Keywords:Rhaponticin, stilbene glucoside, anti-diabetic activity, structural characteristics of RHA, anti-oxidation activity, anti-allergic activity. Abstract:Rhaponticin (RHA) is a stilbene glucoside compound that can be found in medicinal plant of Rheum L. RHA has been reported to possess several biological effects including antitumor, antithrombotic, antioxidant, vasorelaxant, defense for gastritis activities. It also shows beneficial activities on diabetic mice. According to reported literatures, an overview of spectroscopy characteristics, pharmacological activity, content determination and pharmacokinetics, etc. for RHA has been presented. Moreover, this work provides a certain reference value for developing the therapeutic drug of RHA.